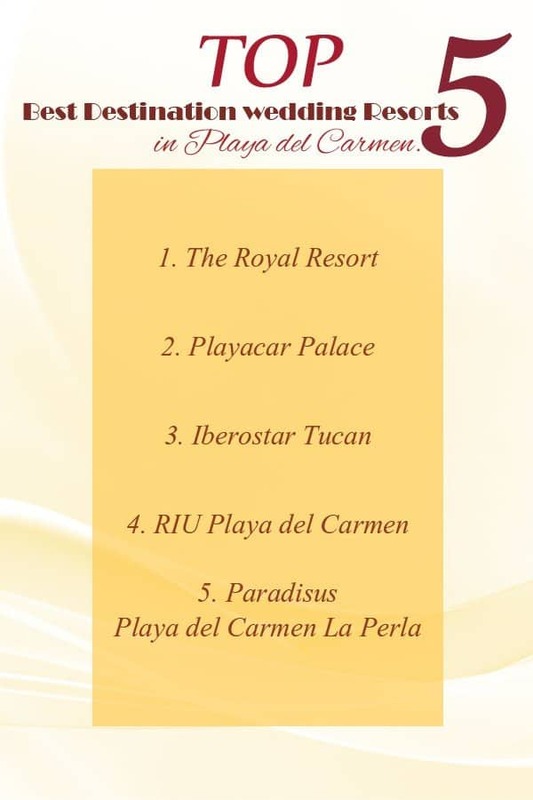 TOP 5 best destination wedding resorts in Playa del Carmen. Why you don’t need unedited photos? Home page → Blog → Playa del Carmen weddings → TOP 5 best destination wedding resorts in Playa del Carmen. One of the big pluses of having a wedding in Playa or in any other resort city is the opportunity to combine the wedding itself and the honeymoon journey. It goes without saying that each of the local resorts has its own professional team that with great pleasure will organize wedding event for you following all the high standards, style and all the details of the decoration will be made according to your preferences. It’s amazing location right in the center of the town will suggest you not only an amazing sea view but also all the possible relaxation procedures to fill your romantic vacation with special atmosphere of serenity and royal chic. In this hotel everything is made according to the high status and to its name. As you can find out from their official information it is the AAA Four Diamond all inclusive resorts exclusively for adults. In this beautiful place surrounded by the clear waters of the Caribbean Sea and the delightfully designed hotel buildings your wedding will turn into a stunning celebration of the two heart union. Modern all inclusive resort located also in the center of Playa del Carmen just 5 minutes walk from the famous central street called 5th Avenue. According to its name – palace and in relation to the location in front of the sea I think it is a good idea to call it tropical palace. All your wishes about the wedding can become real here in Playacar Palace one of the best destination wedding resorts in Playa del Carmen. The resort suggests several unique and special packages to every couple who wish to turn into reality all their dreams about a destination wedding. The location of the resort in the lash, tropical eco system is perfect to make your wed day unforgettable. The world wide famous chain of hotels represents in Playa several of its resorts. All of them are decorated in its own style so you can choose one according to your wishes and preferences. Weddings here are organized (as well as in RIU’s wedding venues in Cancun) by professionals who will take care of all the organization moments and you will fully enjoy your wedding ceremony and following party. A perfect place for the perfect wedding vacations. The last in this TOP 5 of best destination wedding resorts in Playa del Carmen is La Perla. With its amazing location in the private bay it can surely suggest you the best sea views and landscapes and the feeling of the paradise vacations. In this place the meaning of the romantic getaway is revealed in its full beauty. I hope this article will be helpful and you will find you perfect wedding location. I will happy to be your wedding photographer and to capture all the moments of your perfect wedding. Contact me to find more information. Cancun, Playa del Carmen, Riviera Maya, Tulum and worldwide.